As we all know, the beating heart of any sport is competition. While boxing had the ‘Rumble in the Jungle’, and golf fans still rave about the ‘Duel in the Sun’, Irish curling fans can look forward this weekend to the ‘Ding-Dong in Dumfries’. Slugging it out in the Mens Senior Championship challenge will be the current champions – Johnjo Kenny, Bill Gray, David Whyte and Neil Fyfe and the challengers – Robin Gray, Peter Wilson, PJ Wilson and Tony Tierney. 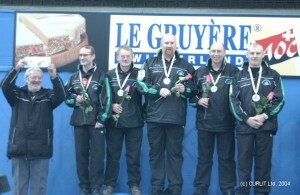 Ireland’s first mens international team – John Furey, PJ Wilson, Johnjo Kenny, Robin Gray and Peter Wilson with coach Gordon McIntyre (left) after winning European B League silver in 2004. 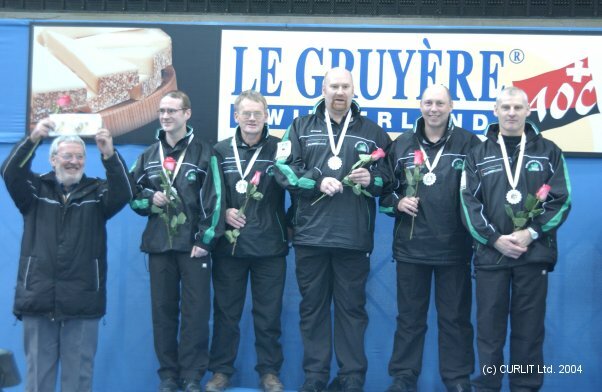 Since Irish teams first played international competition in December 2004, most of these eight players have spent their Irish curling careers as teammates rather than opponents. Four of them took Ireland to the Mens World Championships in 2006. Are they competitive?……… Has the Pope a balcony? All ICA members should try and get to Dumfries Ice Bowl to see the action – you’d be mad to miss this one.